32 pages, black and white, $2.99, in stores on May 13. Another strong cover from Charlie Adlard with a suitably enticing byline. ‘Salvation?’ Probably not! Is this man a Preacher who is bringing with him the hunters seen in ‘The Dead Do Not Stalk‘ and ‘The Dead Do Not Track‘ teaser posters? Or is that another plot thread altogether? I love the fact that he (the Preacher) is walking serenely amongst a bunch of roamers (including on the right hand side of the cover – something quite bizarre and moving – what looks like an undead mother and her young son). Are the revenants following him, as opposed to hunting him? Why are there undead lying immobilised on the floor – especially as they seem to have their heads intact? What is going on with that fire in the foreground of the picture? These covers always pose lots of questions. 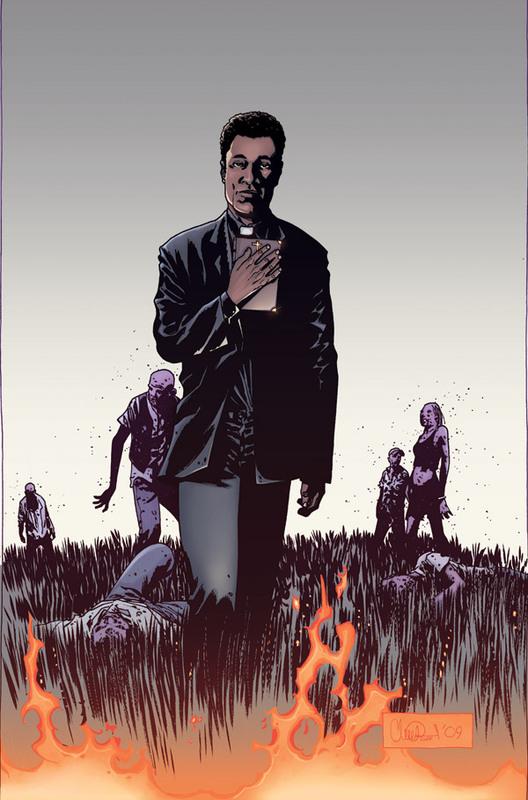 It is good to see Kirkman continuing to bring in new characters and scenarios. This is shaping up to be a classic period for a title that is consistently providing quality entertainment.